Joe Flacco spent 11 seasons with the Baltimore Ravens as the team’s starting quarterback. It was a run that included a Super Bowl win. Last year, the Ravens selected quarterback Lamar Jackson with the last pick of the first round of the NFL draft. When the Ravens struggled midseason, the team made the call to bench their veteran quarterback in favor of Jackson, exposing the cruel realties of being an aging player in the NFL. Flacco watched helplessly from the bench as Jackson inherited the offense of a 4-5 team and helped lead the Ravens to a 6-1 finish and a berth in the playoffs. His career with the Ravens over, Flacco is now slated to start for the Denver Broncos after an offseason trade. He does not sound interested in a repeat of last season. 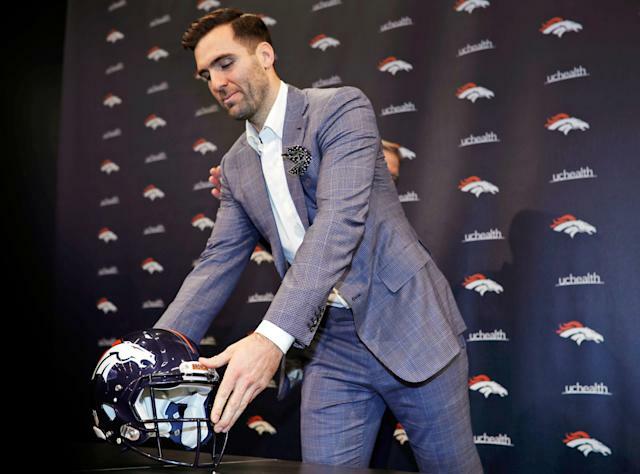 Flacco said Tuesday that he doesn’t care if the Broncos take a quarterback in the first round of next week’s draft. He then went on to extoll the virtues of the team not selecting his replacement with the 10th overall pick. “I don’t really care about whether they take a quarterback or not,” Flacco told reporters on Tuesday. “Whether it’s 10 or whatnot, the only thing I care about is — like I said — I want this team to be as good as they can with me at quarterback. You really don’t care, Joe? Aside from saying that he doesn’t “really care” if the Broncos take a quarterback, those are the words of a man who cares if the Broncos take a quarterback. Flacco, 34, is not the answer for the Broncos’ future. Denver has repeatedly failed under general manager John Elway to find its franchise quarterback since the end of the Peyton Manning era. Neither Paxton Lynch, Brock Osweiler, Trevor Siemian nor Case Keenum have found success behind center. If the Broncos think the quarterback of the future is available with the No. 10 pick or beyond, they’re going to select him. And Flacco realizes that, even as hard as he’s selling the idea of building a team around him. “I think I had a pretty good outlook on it last year,” Flacco said. “It is what it is. I want to get this team to be the best it is with me at quarterback position. Obviously, that is not of most importance to draft a quarterback. The reality for Flacco in Denver is that’s he’s fortunate to find a spot where he can compete for a starting job following multiple mediocre campaigns in Baltimore. Whatever the Broncos decide to do in the draft is well out of his hands.